This New Year, till January 31 when acquiring special price smartphones from Ucom’s sales and service centers, the customers will get 20 GB of mobile internet to be consumed during 6 months. In particular, the Xiaomi Mi A2 Lite smartphone operating with Android One will be possible to acquire at the price of 87 900 AMD instead of the previous 104 900 AMD, while Samsung Galaxy J4 released in 2018 will be available at the price of 67 000 AMD. Moreover, existing and new subscribers of Ucom’s Prepaid service, as well as Ucom Universal or Universal Plus postpaid tariff plans will get 20 GB of mobile internet for 6 months without any commitment. The smartphones can be purchased by paying cash or benefiting from a credit payment option. “During this year we’ve come up with a number of price drop offers and we did that without having to wait for any special occasion. 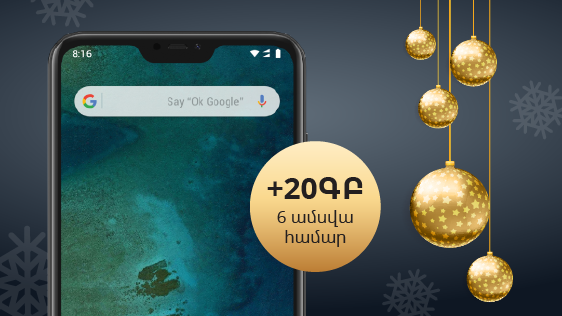 Ucom’s customers are well aware that they can get the newest smartphones at any time with the possibility of warranty and post-warranty service”, said Hayk Yesayan, the Co-Founder and Director General at Ucom. Let us add, that the 20 GB internet bundle will be provided with any smartphone purchased from Ucom. The technical characteristics of the smartphones are presented at Ucom’s internet shop.